Dynamite Threads: A late Halloween tidbit and some jammies for little hands. A late Halloween tidbit and some jammies for little hands. Things were very busy here for a while, I apologize for not updating. I assure you I've been sewing though! 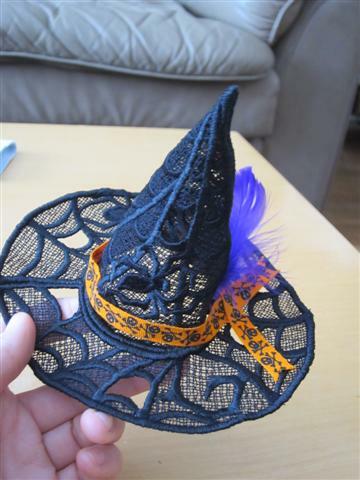 First up is this little witch hat that I made with my embroidery machine. 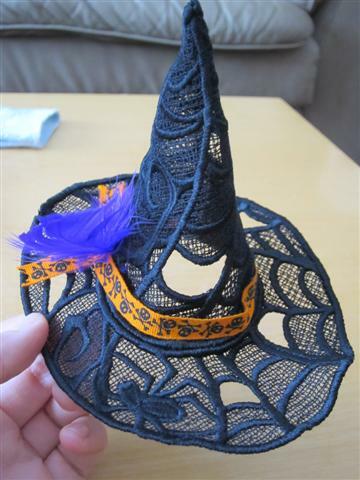 Yes, I made the lace pieces and assembled a witch hat out of thread! Luckily I took a picture of it still in pieces so you can see how it works. The embroidery design is from Urban Threads, they are my favorite! It's a huge embroidery, it took about 6 hours if I remember correctly. I made it in time for Halloween but I didn't get a chance to blog about it. It is three pieces that are hand stitched together. Making lace on the embroidery machine is a really cool thing. The design is stitched onto a water soluble stabilizer. Once the design is done I soak the piece in water and all that is left is thread. How awesome is that? 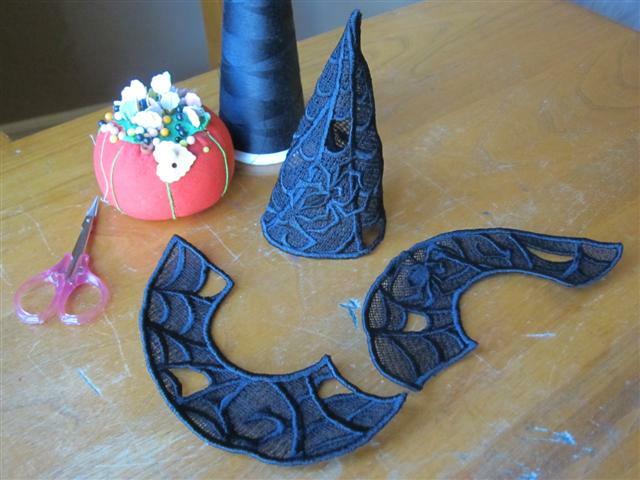 There are some great holiday designs for making ornaments and tree toppers etc. Here is a finished picture. I put on some ribbon trim and a feather. And the other side. I had visions of making Ivy a Halloween dress and leggings to go with but the dress will have to wait for next year. I did get her leggings made, but those will be a surprise for next year with the whole outfit. My oldest son had his 7th birthday shortly before Halloween. I made him a new outfit to celebrate in. 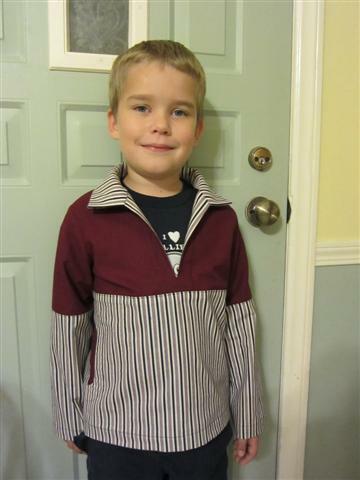 This is an Oliver+S pattern, of course. It's the Nature walk pullover and pants, size 7. I made several of these pants for both boys. The shirts are really cool, the front panel on the bottom is a big kangaroo pocket. Very handy for Lego. 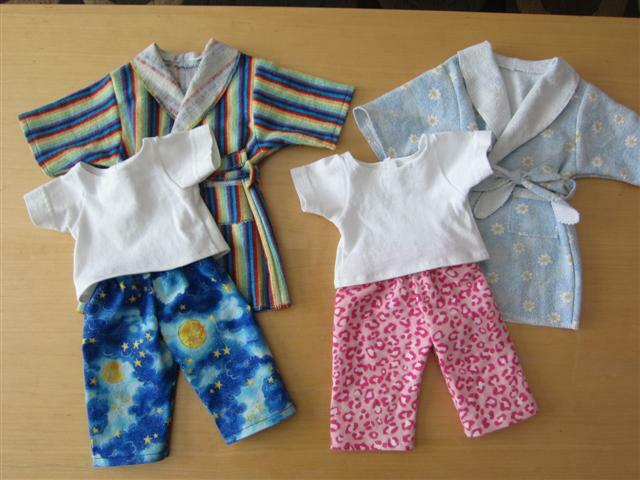 A while back a local mom asked me to make her little ones some pajamas and robes for their dolls this holiday season. I finished her order this week and here it is. She gave me a bag of things to potentially recycle and between her bag and my fabric closet I came up with some relatively coordinated sets. The dolls her girls have are called Earth Friends. They are really cute soft dolls made from recycled materials. I modified my patterns to fit these dolls. Their proportions are different from 18" dolls but I think these will fit their 14" Earth Friends nicely. I made the collars quite wide and the sleeves wide too, to accommodate their hands and necks. I put aplix (like velcro) on the backs of the shirts for easy dressing. 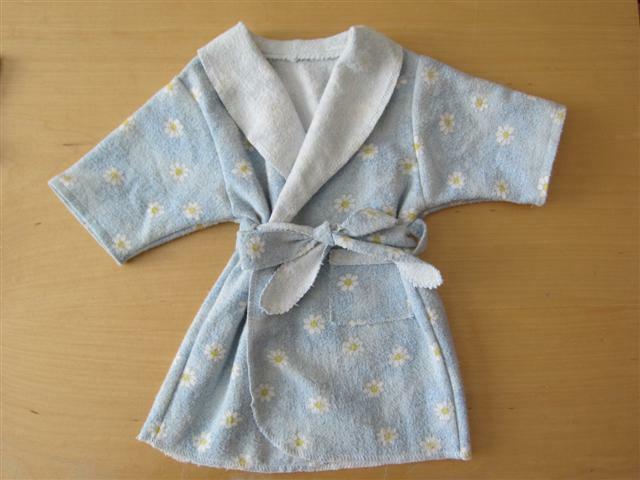 The robes are very simple, they each have a pocket and the ties are sewn at the center back of the robe. 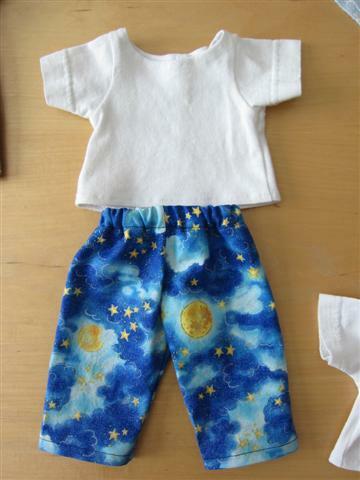 The pants have elastic waists and everything is machine washable for years of durable clean play. 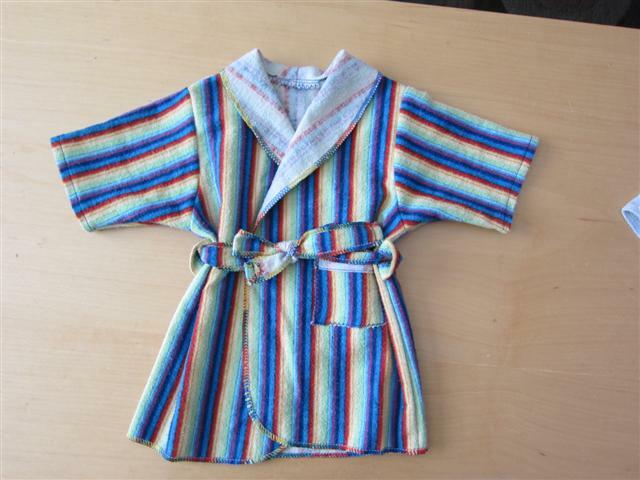 The shirts are upcycled t-shirts and the robes used to be adult pajama pants. The pants are made with fabrics from my stash. I'm amazed by the hat - I can't imagine the patience it took to complete it. How many spools of thread did it take to complete it? Thanks! I buy large spools of embroidery thread for my most commonly used colors. This barely made a dent in the black one. I did have to refill the bobbin a lot.